The composition and style of the deeply carved dragon design on the cusped aprons of this kang table resemble dragons found on blue and white porcelains of the middle Ming period. The boldly curved cabriole legs, their origins traceable to the Zhou Period, have bevelled extension grip pads underneath. These pads not only secured the feet to the cushions covering the kang platform, but also prevented their scrolled flower blossom and leaf design from sinking out of view. A large lingzhi fungus, symbolic of long life medicine, crowns the top of each leg. The placement of this decorative element at this section of the leg is rarely found on kang tables, which usually have, as also seen in this piece, a smaller version of lingzhi fungus carved upside down in the center of each apron. The curves of the legs and aprons, along with the rounded edges of the beading and richly carved motifs, harmonize and complete this table’s overall scale and design. Three vigorously grained huanghuali panels are framed on the beaded edge of the top. The waisted inset panel and beveled foot pads add a few inches to the typical height found on kang tables, making this piece more practical and functional for everyday use. 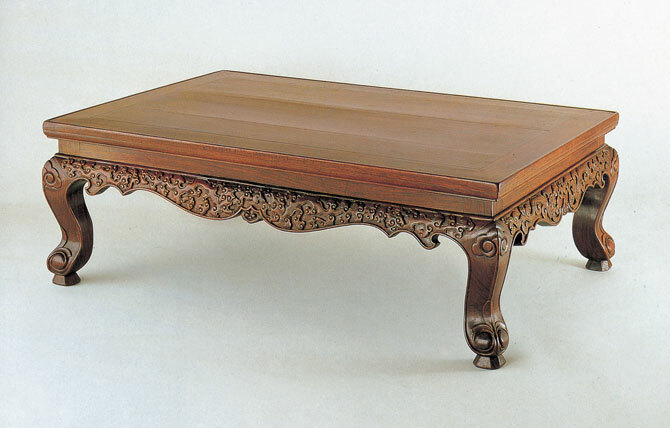 A plain and smaller zitan kang table (circa 1400), with cabriole legs, beveled foot pads and remarkably similar proportions and design illustrated in the Honolulu Academy of Arts’ Chinese Hardwood Furniture in Hawaiian Collections, Plate 2. This Kang Table is now in the collection of Senator and Mrs. John D. Rockefeller IV.